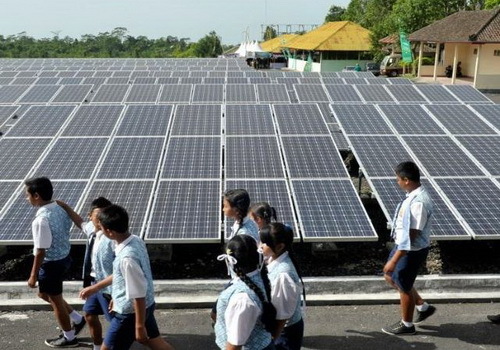 Indonesia targeting a contribution of 5,000 MW of solar power in 2019 and 6,400 MW in 2025 from a total of 35,000 MW of renewable energy projects. The Consortium of National Photovoltaics Industry Independence or KKIFN says it will accelerate the development of solar power component industries to accelerate the associated ecosystem. The Consortium of National Photovoltaics Industry Independence (KKIFN) will undertake the development of component industries in an effort to accelerate the development of solar power plants. KKIFN Chairman, Ngakan Timur Antara, said it will accelerate the implementation of several regulations related to the construction of solar power plants. Indonesia has targeted to increase its renewable energy mix from 5% in 2015 to 23% by 2025 where the projected contribution from solar power plants is 5,000 MW in 2019 and 6,400 MW by 2025. Currently solar power utilization is only 100 MW. Antara said the consortium will facilitate connectivity between business actors and stakeholders. The ability of the supporting component industry in Indonesia to supply the needs is still very low. Currently industrial components such as solar modules are only produced with the equivalent amount to generate 100 MW of electricity per year. "This is an agency that provides services to potential investors and potential users of solar energy," Antara said on Tuesday. Antara said the consortium will raise investment to increase production capabilities to boost the required component industry. Another problem is the price required for solar module investment is still expensive and not comparable with fossil power plants. "The estimate for solar module investment to generate 1 MW is US$1 million and the land is about 1.5 hectares," Antara said. KKIFN was established on June 27, 2016 involving several ministries, Indonesian Institute of Sciences (LIPI), Bandung Institute of Technology (ITB), Manufacturers Association of Surya Module Indonesia (APAMSI), LEN Industri, and Antam. Also PT Timah, Wijaya Karya, Sky Energy, Ceprindo, TUV Rheinland, and Canadian Solar Inc.